1st 5 hrs £15.00 each !! !Don´t slip out!!! Book now save £45.00!!! 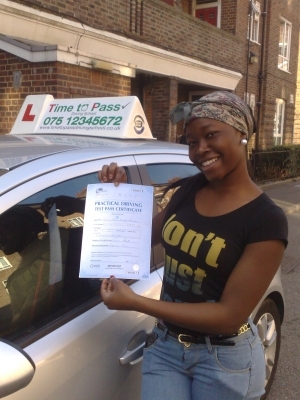 If you´re ready to learn to drive in or around Dalston then you will want a driving instructor who will give you the best chance of passing your test 1st time. Time To Pass Driving School provide learner drivers with driving lessons tailored to suit the individual so learning to drive is always achieved at the ideal pace. Dalston based learner drivers can be picked up and dropped off from a designated location with the area whether that be home, school, college, Uni or work so you could even use the lesson as a way getting from A to B! call us on, 075 12345672 today and get on route to your independence.